Look up! 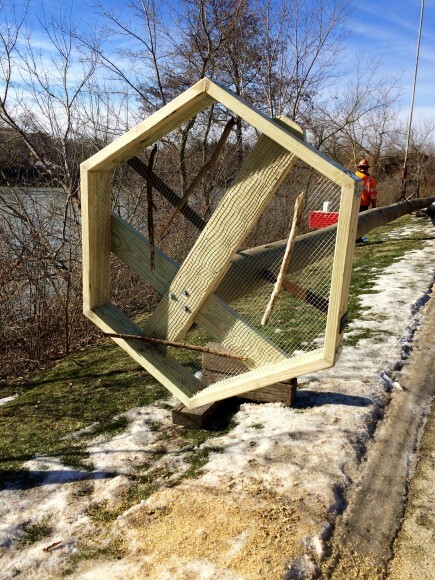 In partnership with Friends of the Chicago River (FOCR) and the Forest Preserves of Cook County (FPCC), an osprey nesting platform was installed on Friday, January 29, along the North Branch Trail at the south end of the Chicago Botanic Garden near Dundee Road. The Garden’s new osprey nesting platform is located near Dundee Road and is viewable from the North Branch Trail. The osprey is listed as an endangered species in Illinois, which means it’s at risk of disappearing as a breeding species. 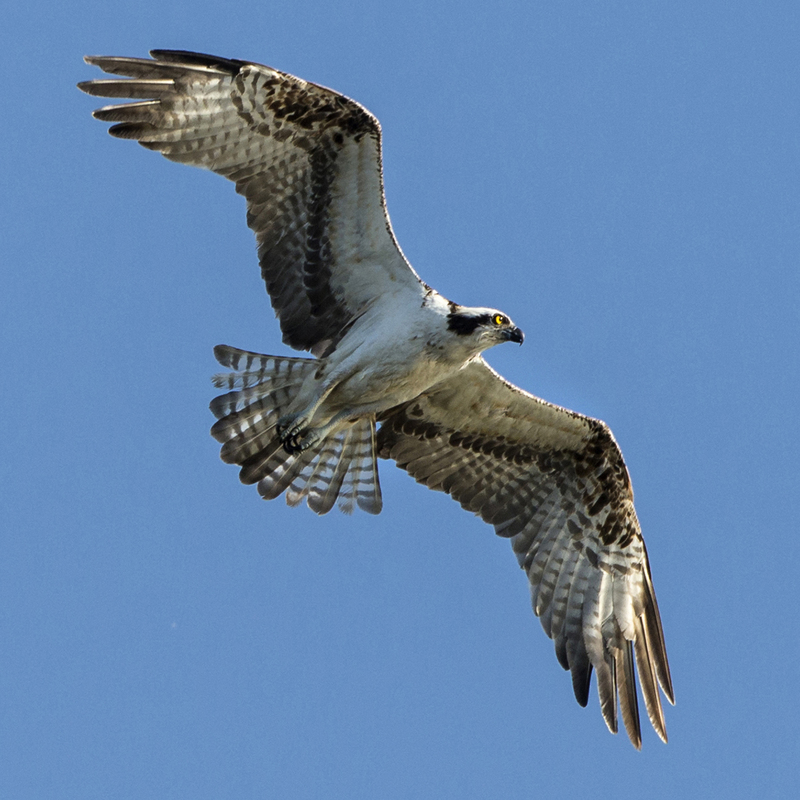 Fish-eating raptors that migrate south and winter from the southern United States to South America, osprey are often seen during their migrations—yet few remain in Illinois to nest. The lack of suitable nesting structures has been identified as a limiting factor to their breeding success here. Males attract their mates to their strategically chosen nesting location in the spring. In order for a nest to be successful, it must be located near water (their diet consists exclusively of fish, with largemouth bass and perch among their favorites), the nest must be higher than any other nearby structure, and it must be resistant to predators (think raccoons) climbing the nest pole and attacking the young. FOCR and the FPCC sought out the Garden as a partner for an installation site, in large part owing to the Garden’s strong conservation messaging and proximity to other nearby nesting platforms that have been recently installed (two are located alongside the FPCC’s Skokie Lagoons just to the south). The Garden’s nesting platform was installed atop an 80-foot “telephone pole,” set 10 feet into the ground and extending upwards by 70 feet. The 40-inch hexagonal nest platform atop the pole has a wire mesh on the bottom so that water can pass through the sticks and stems that the osprey will bring to construct the nest. 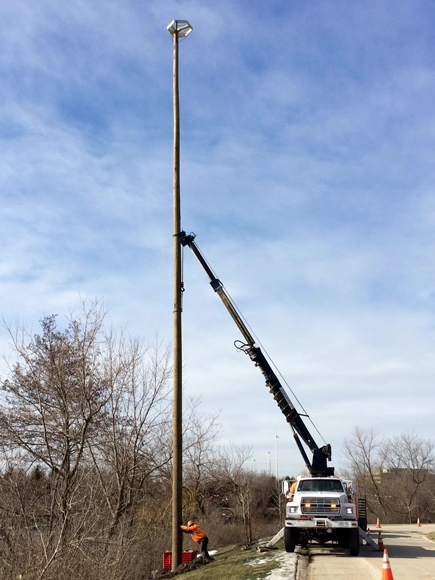 A truck-mounted auger and crane set the nesting pole and platform into place. The nesting platform sits atop the pole and is ideally sized for a future osprey nest; notice that we even “staged” the new osprey home with a few sticks of our own! A metal band was wrapped near the bottom of the pole to prevent predators from being able to climb it. 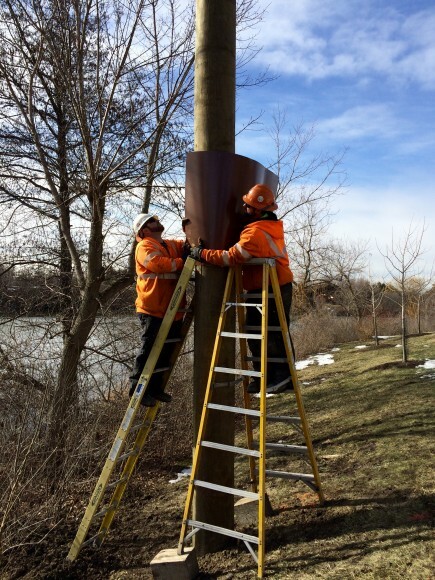 The nesting pole and platform is fully installed and is visible from the North Branch Trail that runs through the Garden. With the osprey nesting platform now in place, our hope is that within the next few years, a migrating male will select the site and pair with a female. Osprey generally mate for life, though they’re together only during the breeding and rearing seasons. You can learn more about the how and why of the osprey nesting platform project at the FOCR website. 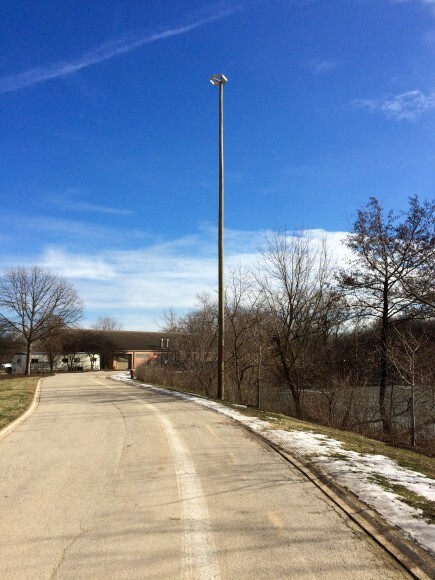 Follow the links on that webpage for images, video, and a press release relating to the installation of an identical osprey platform at the Skokie Lagoons last spring. 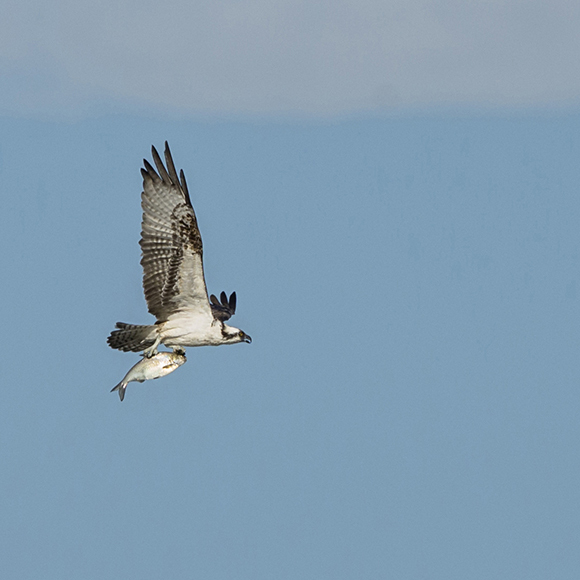 Read more about the long-term effort, and about ospreys making a comeback in Cook County. Discover birding at the Garden and find our full bird list online at chicagobotanic.org/birds.